For most of us, wood smoke is something we experience every once in a while from campfires, a fireplace burning nearby, and so on. We know what it feels like to get smoke in our eyes; to accidentally breathe some in, but probably just for a few moments. However, in many parts of the world, smoke plays a very different role in people’s everyday lives. More than a third of the world uses wood and charcoal fires to heat and cook – often indoors with smoky, traditional open fires and stoves. 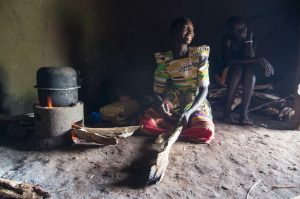 During a three-week field trial for a cookstove usability evaluation, I found out first-hand what cooking is like for families in rural Uganda. As a student working toward a dual Master’s degree in mechanical engineering and anthropology, I traveled there to work with our colleagues at International Lifeline Fund to test a protocol I had developed to measure how effectively and efficiently a stove meets people’s needs. 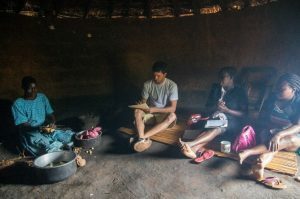 This work allowed me to combine engineering and social science research, and spend hours at a time in thatch-roofed huts talking to women about their stoves designs and cooking habits while they cooked. 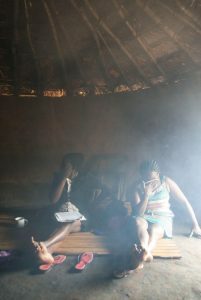 It also required me to experience the same level of smoke as these women and their families. Traditional kitchens in this region are basically windowless, garden shed-sized rooms with indoor bonfires, so they tend to look and feel like a steam room after a few minutes of cooking (but filled with smoke, instead). 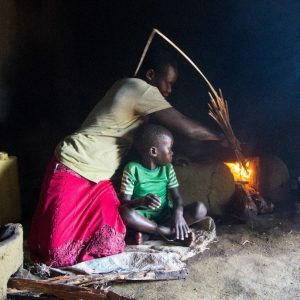 The effects of this much smoke on those not accustomed to it, such as some Ugandan translators and myself, include increased complaining, coughing, and borderline uncontrollable weeping – as if we were cutting onions for hours on end. In addition to the literal sweat and tears dripping on my field notes, this experience drove home the significance of this work and these problems that I’d read about, but never quite been this close to. According to the World Health Organization, this level of exposure on a regular basis is roughly equivalent to smoking two packs of cigarettes a day , and indoor air pollution causes more premature deaths than dirty water or all infectious diseases , . Hundreds, if not thousands of improved cookstove designs have been tried around the world in attempts to reduce smoke exposure, among other issues, yet many of them have never caught on, in no small part because these stoves do not always meet cooks’ needs. Engineers working on these issues don’t often have the opportunity to collaborate with social scientists and other experts, so they tend to produce stoves that burn cleanly and efficiently, but sometimes at the expense of the ease-of-use, practicality, and ability to cook staple foods offered by traditional cooking methods. As a result, many improved stoves predictably go unused or unsold and never have the impact intended. The test results and field notes from this trip (which still smell like smoke) are now helping us to improve this usability evaluation protocol. We will hopefully be able to make it into a practical tool for engineers and others to better balance design criteria, ultimately enabling production of more stoves that are clean and effectively, efficiently meet cooks’ needs. The use of social science research methods was new to me, as an engineer, and helped me to understand many details about cooks’ lives and attitudes beyond usability that could not have been revealed without these in-depth interviews and surveys. I am currently working to have the protocol incorporated into the global ISO standard for cookstove design and evaluation. Next year, I hope to bring this usability evaluation to another part of the world to test the protocol in another culture and on different types of stoves. © 2019 Humanitarian Engineering Student and Faculty Blog, all rights reserved.